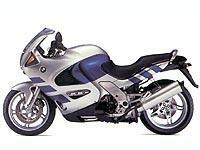 BMW is preparing to give its K1200RS a facelift and an extra dollop of power. According to European sources the big sports tourer will be getting a 100cc big-bore, taking it up to 1300cc, as well as a new name to suit its capacity. The new K1300RS should be launched at the German company’s home show in Munich this September, along with an updated R1150R. There’s further speculation that the R1150R may also have a capacity increase to 1200cc. Factory insiders have also hinted at a brand new R1200LT - that looks like a cross between a R1200C cruiser and the K1200LT tourer.